Plus, how well can they recall pivotal moments in their characters' wild lives? 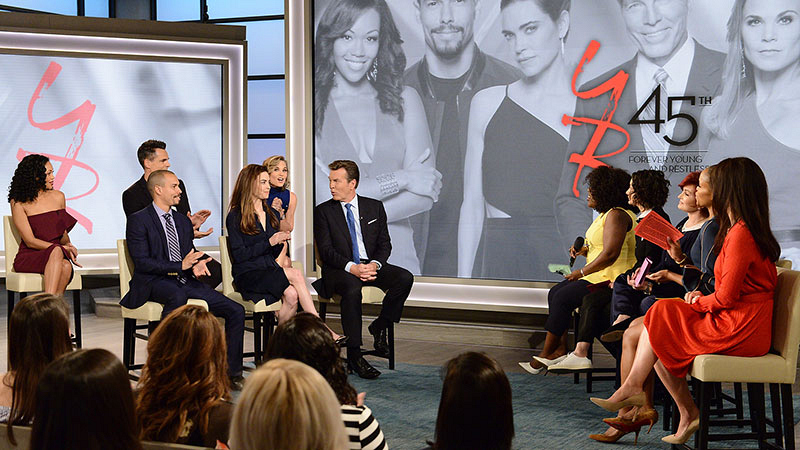 With next week's 45th anniversary of The Young and the Restless coming up fast, cast members Amelia Heinle, Peter Bergman, Gina Tognoni, Jason Thompson, Bryton James, and Mishael Morgan joined the hosts of The Talk to discuss their favorite character moments—and test their impeccable Y&R memories to win the studio audience a prize! Check out the clip above for the full discussion of the cast's favorite moments! Peter, who has played Y&R mainstay Jack Abbott since 1989, weighed in on his favorite Jack moment during his time on the show, which of course ties back to the fan-favorite feud between Jack and Victor (Eric Braeden). It was when Jack was stuck between a rock and a hard place following Victor's heart attack in his office. Would Jack call the police or just leave him there? In classic Jack fashion, the character opted to make his way out—and kick the ailing Victor's hand out of his path—an unscripted moment that Bergman loves to this day, saying, "It was, for me, a delicious moment as an actor because they actually caught it on camera." For Amelia, who's played Victoria Newman since 2005, said that working with Thad Luckinbill again with the return of his character, J.T. Hellstrom, has been just like old times. "It's been a wonderful storyline and I love having him back," she told host Sara Gilbert. Bergman added, "Wait until you see where it goes!" The conversation turned to Bryton, who joined Y&R as Devon Hamilton while still a teenager in 2004 and has been part of major storylines ever since. His favorite, however, was when Devon went deaf and the impact it had on fans. He recounted a story about a touching meeting with a deaf viewer who appreciated how Bryton and the show handled the familiar struggle. "To experience losing a sense is something you can't understand unless you really go through it," Bryton added. Mishael, who plays Devon's wife Hilary Curtis, recalled how she was actually nine months pregnant while shooting their characters' wedding. In fact, she had her baby only nine days after they shot the scene! She even showed off the clever camera angles and huge bouquet that the crew used to hide her baby bump. Gina, who took over the role of Phyllis Summers in 2014, said of her favorite moment, "It's a lot of fun sleeping with your husband's brother!" She added, "We had a secret for four months, and in Daytime, that's like gold!" Though Jason is a comparatively recent addition, having spent the past two years as Billy Abbott, he's been part of memorable couples like Villy (with Victoria) and Philly (with Phyllis), and said hearing the passionate feedback from Y&R fans is "why [the show] has been there for 45 years." 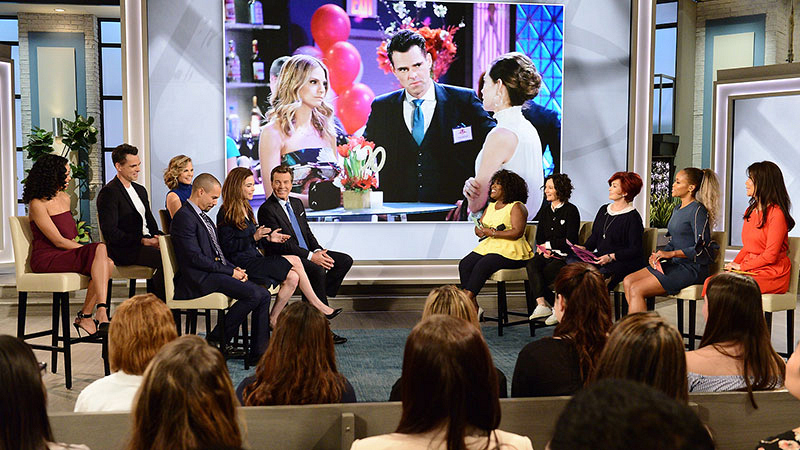 The up-for-anything cast also participated in a Y&R flashback game, revisiting classic moments in their characters' lives to see if they could correctly recall what came next in the scene. From throwing a chair out a window to slapping a lover across the face—hard—these actors had no trouble getting a perfect score and earning the studio audience a prize! Watch all-new episodes of The Talk and The Young and the Restless Weekdays on CBS and CBS All Access.